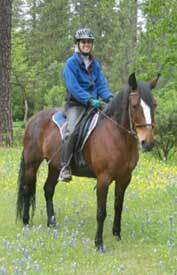 My Mustang, Chips, has been ridden as a distance horse for the last 10 years. (slow distance) I have probably ridden her 10,000 miles, all in the mountains. Several years back I could see an elusive something in her gait in the round pen and switched from an oral glucosamine to generic Adequin injections about every two weeks. This seemed to make the issue disappear and I continued this for a couple of years. Then in June of 2004 a lameness appeared. I took her to Dr. Black at Pioneer Equine Hospital. She was diagnosed as grade 2 lame (meaning every step) in the front left leg and x-rays showed early-onset arthritis of the fetlock. Dr. Black believed this would be slow to progress and gave her a shot of hylauronic acid and a special steroid directly into the site. He said if this worked that it would last 3 to 6 months and then she could get another shot. The shot improved the condition about 80%. I was happy. About 1-1/2 months after this I contacted Gloria and she concocted a “Chips special” herbal remedy. I expected that at best it might slow the progress of her condition. I truly did not expect to see a change. Several weeks later I was pleased to notice Chips actually moved much better. She had gotten to the point at one time where she didn’t want to buck and kick up her heels in the round pen as it was uncomfortable. Soon She started acting her feisty self again. I stopped the glucosamine injections in the early fall of 2004 as I was tired of the needle thing and she remained very sound. It has now been 11 months since she had the injection at Pioneer and she is still doing fine. I can tell there is something there that is a slight bit off but we just minimize the work in circles to the left or make them very large and all has been well. I can’t see any reason why this horse would still be this sound other than Gloria’s herbs. She is taking nothing else for joint health and in fact the only other supplement she receives now is a vitamin mix, which she’s been given for years. I am very grateful to Gloria and definitely a believer.